Sip on a glass of vino, puff on a cigarette (yes, you can smoke here) and look smart at the same time. Open Sun.-Wed. until 4 a.m., Thurs.-Sat. 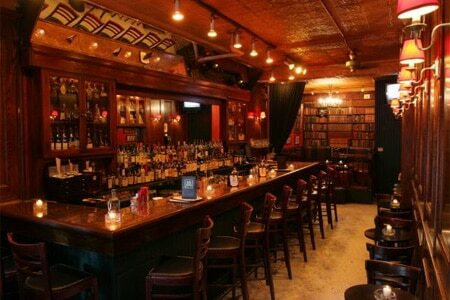 until 4 a.m.
: Neither a library nor a bookstore, this West Village bar simply uses books as décor. The quasi-posh crowd mostly comes here to sip on cocktails and smoke cigars, as it’s one of the few establishments in the city that allows customers to toke. The dimly lit one-room bar---bedecked with books from floor to ceiling and crammed with comfortable chairs---isn't the most reasonably priced place in town to get a drink, but where else can you enjoy a glass of vino, puff on a cigarette and look smart?